This shouldn’t be news to you. But it is important that we as humans are reminded of this simple truth. Dogs like wolves are highly social species. They remember their interactions and are strongly inclined to create bonds with other beings. They do not like to be isolated and they love interaction be it with you, or a dog, a child, or your other pets. They even try to interact and make friends with cats. A cat may not like that but the dog will still try unless he gets a punch from the cat. In short, dogs love interaction and playfulness and happy exhaustion of energy. This sounds awful similar to a species known to us, HUMANS!!. Yes, we are like dogs in some ways. We are social beings, we love interaction with the world, we love playfulness and we like to exhaust our energy. However this is not being realized by most of us. Some how we are too busy for ourselves. Your dog doesn’t understand this, she wants to play and exercise all its senses. All this is simply what a dog would like to do as daily activities. By interacting with other dogs, the dog will feel alive and realize there are other alive beings around him, who are interested in him and who wants to play with her. Socialize, romance and health that’s what a dog loves. We should be inspired by them and recall these are the things we love to and somehow use our dog’s presence in our lives to change and revive our lives, if somehow we are stuck. 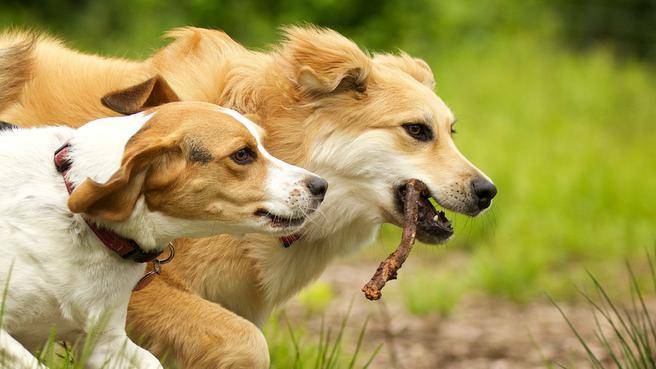 Interacting with other dogs, makes you happy because he/she can exercise themselves fully. One is physical exercise and the other side is the sensual exercise. Sadly we are overfeeding our pets and making them exercise only the taste and smell sense only. Interacting with other dogs can make them exercise their entire make-up completely. You must have seen that the street dogs live in a whole another world. They have friends, families, fights and all kinds of games. They are more raw. Imagine your dog being lost on a street some day. How long will he/she be able to survive? Well, there is no guarantee. However, one can prepare the dog if the dog is walked around in the area, is familiar with the area, is aware of the dogs and danger zones in the area. If your dog is a total noob, then there are more chances of him totally panicking if lost or even in case when it runs away with leash. We should never forget that dogs are social pack animals and descendants of wolves. Certain things are in their DNA, though we are training them in various ways but wouldn’t it be harsh to change their entire way of life by denying them interaction with other dogs? organise regular swimming meets with other dogs.